ConAgra Foods Inc has won the dismissal of a lawsuit filed by consumers claiming the company’s Hebrew National hot dogs and other products are not kosher. Modesty in Ultra-Orthodox Brooklyn Is Enforced by Secret Squads: "Shadowy committees have threatened shop owners over mannequins they don't like, and reportedly have invaded homes to seize computer equipment." The Brooklyn shopkeeper was already home for the night when her phone rang: a man who said he was from a neighborhood “modesty committee” was concerned that the mannequins in her store’s window, used to display women’s clothing, might inadvertently arouse passing men and boys. Some men are sexually aroused by mannequins! Definitely not kosher! Ha ha ha, how funny is this!? From The New York Times OPINIONATOR | DRAFT come an essay on translation, a subject we detest, "The Treachery of Translators." The Times reports how, A translator learns that the law of karma can be unforgiving. We suffered for years translating and publishing rabbinic texts, Mishnah and Talmud. Oh yes we pretended it was fun. And sure it gave us daily puzzles to solve and limitless opportunities to be clever. It was in fact wretched and tormenting work. We don't do it any more. And we don't miss it even for a nano second. The Times essay uses the silly clever funny suggestive assertion, "You are only as old as the woman you feel" as a quintessential instance of a sentence whose double meaning cannot be conveyed in a word for word translation. Doh. As if we did not know that much stuff, "loses in the translation." It's always unnerving to confront those well written pieces that start off with a universally obvious premise, probe and poke it and conclude with nothing new. Okay, this blog post tells you that the Times does that and you say that's obvious. Touché. Are Legumes Kosher for Passover for Ashkenazic Jews? From Haaretz - the "legume revolution" has begun and many are saying that yes, legumes are kosher for Passover for Ashkenazi Jews, under certain circumstances. We find this debate and discussion to be a caricature and burlesque of the meaningful human, social and philosophical purposes of religious theology, law and custom. Efrat rabbi tilts against Passover food restrictions for Ashkenazi Jews. Others, unhappy with holiday legume laws, launch Kitniyot Liberation Front. Trying to ease the life of Ashkenazi Jews who observe the dietary laws of the upcoming Passover holiday, an American-born Orthodox rabbi recently issued a halakhic ruling expanding the menu of permitted food products during the weeklong holiday. According to Ashkenazi custom, the consumption of legumes and other non-wheat grains, known as kitniyot, during Passover is forbidden because of a resemblance to hametz, leavened grain, which is strictly prohibited on the holiday. Since most Israeli Jews who observe the holiday's dietary laws are of Sephardic descent, and thus do not have this custom, many kosher for Passover products in the country contain kitniyot, such as rice, corn and beans. In recent years, a growing number of Orthodox Jews - especially Western immigrants to Israel - have started rebelling against the kitniyot ban, arguing they are adapting to the Israel's mainstream practice because the ban is a custom and not law. The photographs of Roman Vishniac are on display at the ICP at 6th Avenue and 43rd Street. We don't expect that Vishniac's portrait of our dad is in the exhibit. Portraits of Albert Einstein and Marc Chagall made it into the exhibit. Upon arriving in New York in 1941, Vishniac turned to photography to support his family, opening a portrait studio on the Upper West Side. Always resourceful, he mined his connections in the Russian and German-Jewish expatriate communities to secure famous subjects for portraits—Marc Chagall, Albert Einstein, and Yiddish Theater star Molly Picon among them. These photographs of well-known artists, intellectuals, and performers helped establish Vishniac's reputation in New York, attracting a broad clientele to his studio, including Jewish émigré dancers, actors, musicians, artists, intellectuals, and scientists. His success in portraiture ultimately allowed Vishniac to pursue photomicroscopy, biology, and scientific research—fields that would become his primary focus over the next fifty years. Vishniac also turned his camera to the city's nightclubs, where war- weary New Yorkers, abetted by a swell of immigrant performers and off-duty servicemen, sought distraction at a frenzied pace. His dynamic and skilled work, focusing on jazz musicians, actors, comedians, and dancers, exhibited here for the first time, incorporated highbrow and lowbrow, popular and avant-garde, focusing primarily on three Jewish- owned nightclubs: New York's first integrated nightclub, Café Society, The Village Vanguard in bohemian Greenwich Village, and the burlesque joint Leon & Eddie's. Much like his earlier work in Eastern Europe, Vishniac's portraits of Jewish émigré intellectuals and performers capture the vitality and resilience of Jewish life, this time from the perspective of a different segment of the diaspora, facing its own set of challenges. They tell us who they are, "DNAinfo.com is New York's leading hyper-local news source, covering New York City's neighborhoods. We deliver up-to-the-minute reports on entertainment, education, politics, crime, sports, and dining. Our award-winning journalists find the stories — big or small — that matter most to New Yorkers." In Orthodox Judaism, men are religiously required to study the Torah, and only they are believed to have the intellectual and spiritual capacity to parse the Talmud. Put simply, Jewish boys are too important to be bothered with frivolous concepts like geometry and grammar, experts on the communities said. “For a young Jewish teenager, it’s a waste of time because he’s supposed to be studying Talmud, Bible, Jewish codes,” said Zalman Alpert, a librarian at Yeshiva University and an expert on Brooklyn's Orthodox communities. Yes Israeli politician Yair Lapid is a Jew. David Remnick wrote about him in New Yorker, and evaluated his performance in the 2013 parliamentary election, "...the great surprise was the second-place finisher, a television celebrity and political novice named Yair Lapid, who leads a brand new—but impressively greased—centrist party called Yesh Atid (“There is a Future”). Lapid appealed largely to young, middle-class, secular voters, and he concentrated mainly on social issues like education and housing and on stripping the ultra-Orthodox of their state subsidies and military exemptions. Facebook, Twitter, and his square-jawed, salt-and-pepper-hair glamour were Lapid’s tools..."
New Yorker has a long rambling article ostensibly about Naftali Bennett, who is a Jew, and a right wing politician in Israel. The article is by David Remnick, editor of the magazine and also a Jew and politically a liberal. Remnick throws into the article his historical narrative about how Israeli politics has veered further and further to the right over the past decades. Full of back-stories and color, as New Yorker articles must be, we wondered about the bottom line motives for this write-up. Our inquiry to a religious friend in Ra'anana asking whether he knows Bennett brought this response, "Bennett lives a couple of blocks away, but I do not know him nor have I ever met him. I am not sure that I have even seen him. He lives a minute away from another big shot, Yakov Amidror who is Netanyahu’s personal National Security Advisor... Bennett has made a big splash, although I haven’t a clew why." ...Bennett’s house is large, modern, filled with sunlight. He and his wife have four children, ranging in age from six months to seven years. There were toys and strollers scattered everywhere, and open packages of Huggies. The place didn’t have the ascetic feel of a settler outpost: there was a Viking stove, a Nespresso machine, laptops, flat-screen TVs. This was the style of the bourgeois pioneer. You see the simple and overt Talmudic logic. Boost the more radical one to split the rightists and thereby to help the left. Postscript: Wait just a sec. Isn't that why and how the radical rightist party Hamas came to power in Palestinian politics? Americans and Israelis thought that boosting them would split and weaken the Palestinian cause. Hmm, maybe that is not such a good logic after all. We believe that divide-and-conquer is not such a good strategy. You just end up shooting-yourself-in-the-foot. An op-ed in the Daily Beast, "Why I Like Naftali Bennett," by Shaul Magid, spells this thinking out in another roundabout way. Our Manhattan Day School elementary school classmate Bella Bryks-Klein has been profiled for her work in promoting Yiddish culture in Israel. Hat tip to our mutual classmate Faye for letting us know. ust above, we saw how the mystic vividly employs and deploys her mythic narratives of heaven. Priests, whom we meet formally as synagogue archetypes a bit down the road in our journey (in the chapter “The Priest’s Prayers”), get in on a mythic mode of their own by imagining the sacrificial orders of the ancient Temple, by making reference to them and by reliving them. For instance, on the Sabbath, the day of rest, the priest recites at the center of his Amidah prayer, not a long paean to the creation in six days and rest on the seventh, but strikingly something else. He chants a recollection of the sacrifices of the Sabbath day in the ancient Temple. annah left me with this thought, reminding me that only one letter changes the “mystical” into the “mythical.” I ought to spend some time investigating the role of the mythical in the synagogue, she suggested. Maybe I will find another identifiable archetype, like Moshe the Mythic. Hannah is quite right that I need to explore myTHical synagogue discourse, that mode of thinking, which is indeed related to—but not identical with—the mySTical. I don’t, however, endorse Hannah’s suggestion that the mythical element in the synagogue is archetypal. I see that the mythical is a pervasive underlying mode of thought that religious Jews who attend the synagogue accept as a given. You may rightly ask, if it is such a given, then please explain already what you mean by the mythical. I employ the term “myth” in a manner that is common in the academic study of religions, not in the way it is used in popular culture. In the latter, a myth is a fantasy, a far-fetched untruth that other people wish you to believe, often so they can deceive you or, perhaps, entertain you. By contrast, in the disciplines of the study of religions, a myth denotes a narrative that is truer than true, a story whose details are not just interesting, dramatic or entertaining. 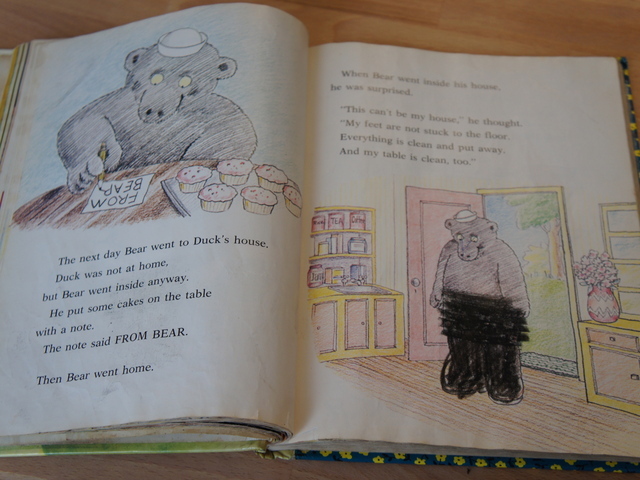 The elements of a mythic narrative bear special deep and timeless meanings for those who retell them. o inquire further into the spectrum of religious experience in Judaism, let’s return now to the Har-El synagogue in Jerusalem, the mystical place I spoke about in my opening chapter above. As you may recall, that small shul was where I once found the perfect davening. At Har-El, I meet one woman who prays there regularly, one of the biblical Hannah’s contemporary incarnations. She will be my spokesperson for the contemporary “mystical” archetype in the synagogue. I call her Hannah too. I ask her to explain more of what she believes goes on when she prays. She tells me that there are other domains of meaning in the universe that we can become acquainted with and learn from. We must accept that there are dimensions of reality beyond this physical world that we inhabit. Our contemporary Hannah assures me that she is a mild and basic sort of mystic. She reminds me that, after all, in spite of her yearnings and proclivities, she still attends the synagogue. She has not left to join a Kabbalah Center or some other center for spiritual practice, somewhat down the road from the synagogue at another location along the spiritual spectrum. Our Hannah tells me that it is fair to classify her as mystical archetype and that she embraces the major mythic elements of Judaism. But she surely cautions me that I may not call her a Kabbalist. Hannah advises me that there is no distinctive profession or status for any of the forms of our mystic archetypes. “Mystical” is more of a description of a discrete personality or mindset—a conglomeration of values as they relate to ultimate questions of the regions of heaven and Earth, the dimensions of time, past and future, and the inhabitants of those other domains. [Ashk. Heb. kah-dish-im; Seph. Heb. kah-dee-sheem]. Judaism. 1. (italics) a liturgical prayer, consisting of three or six verses, recited at specified points during each of the three daily services and on certain other occasions. 2. (italics) Also called Mourner’s Kaddish. The five-verse form of this prayer that is recited at specified points during each of the three daily services by one observing the mourning period of 11 months, beginning on the day of burial, for a deceased parent, sibling, child, or spouse, and by one observing the anniversary of such a death. 3. Kaddishim, persons who recite this prayer. n my spiritual quest in scores of synagogues, not surprisingly I sought after and expected to meet up with some mystical personalities. After all, mystical traditions are inextricably associated with the religions of the world. Allow me introduce you to Hannah the mystic, one such ideal type whom I met. To do this, I first must take you way back to the earliest description in Tanakh of an individual reciting a prayer at a sacred shrine. The brief narrative from I Samuel chapter 1 tells us about the Israelite woman Hannah, who recited the first silent prayer in the biblical record at the tabernacle at Shiloh. The biblical Hannah’s story is a sad one. She was childless and she wanted a child, so she came to the tabernacle entrance and just went ahead and poured out her soul directly to God. Every successor to Hannah who prays to God in a synagogue, Temple, or anywhere, engages in an analogous mystical act and shares in the belief that his or her words or thoughts somehow unacoustically travel to God’s ear. Once, when they had finished eating and drinking in Shiloh, Hannah stood up. Now Eli the priest was sitting on a chair by the doorpost of the Lord’s temple. As she continued praying before the Lord, the priest Eli observed her mouth. Hannah was speaking in her heart; only her lips moved, and her voice was not heard. Therefore Eli took her to be a drunken woman. Yes, Jack Lew is a Jew. President Obama has nominated him to be the secretary of the treasury. Hazzan. It’s obvious that we may apply the label, performer, to an accomplished hazzan, a cantor. He leads the services from the designated places for leaders, the bimah in the center, or the amud in the front of the synagogue. At the least, the hazzan has to be a master of the basic nusach and niggun of the synagogue, that is, the words of the prayers, their traditional tunes and how they must be performed in the services. Chorus of the Congregation. The congregation actively participates in the services of the synagogue. So that makes them performers, too, although the intensity of their involvement varies from one instance of prayer to another. Torah Reader. The Torah is read from the bimah in the center of the sanctuary. On Sabbaths and festivals, it is read in the middle of the service, after the morning prayers and before the additional prayers. It’s easy to see that the reading of the Torah is central to the synagogue performance. “Torah Reader” is also a part that everyone in the community gets to play at least one time. For the rite of passage for coming of age, the Bar Mitzvah Boy and the Bat Mitzvah Girl (except in most of the Orthodox community) must prepare for and play this role of Torah Reader. For the occasion, the young boy or girl usually will study and prepare to read a portion from the Torah in the synagogue on (or near) his or her coming-of-age birthday. 1. the Pentateuch, being the first of the three Jewish divisions of the Old Testament. Compare Tanach. 2. a parchment scroll on which the Pentateuch is written, used in synagogue services. 3. the entire body of Jewish religious literature, law, and teaching as contained chiefly in the Old Testament and the Talmud. the three Jewish divisions of the Old Testament, comprising the Law or Torah, the Prophets or Neviim, and the Hagiographa or Ketuvim, taken as a whole. antor Louis Danto was a happy hazzan. His chanting was upbeat and peppy. I often heard him chant the synagogue services at the Atlantic Beach Jewish Center when I was a child and teenager in the 1950s and 60s. Just by listening to him I knew then that Danto was a world-class singer, a tenor whose beautiful voice was trained and ethereal. And I could see that he comprehended and loved the words of the prayers and cherished their meanings. I did not know at the time that he had studied at Talmudic yeshivas and in musical conservatories in Europe, and that he had won prizes for his talents. I could not have known that he would go on to perform worldwide, to record many albums of Jewish songs, of folk, popular, romantic and operatic music. As a boy in Atlantic Beach, I could not foretell that this leader of our prayers years hence would be celebrated for his unmatched graceful yet ornate bel canto artistry, for his classical vocalization and for his just plain beautiful singing. I did recognize that I loved his extraordinary rendition of the Shehecheyanu blessing after the Kiddush on a Yom Tov holiday. In it, we praise God for keeping us alive and bringing us to a special sacred time. His blessing rang out with such emotion and expressivity that it just lifted my soul. I can recall vividly—and to this day—Danto’s ringing repeated conclusion of the blessing, “Lazman hazeh, lazman hazeh…” which means, “…to this time, to this time.” And I’ve tried at every holiday to replicate the joy of that singing as best as I can in my own chanting of the same blessing. Danto defined for me an ideal—how a formal davening should sound. Wow, he set the bar way high up! His lyrical singing always changed the very character of the sanctuary. From listening to him, I learned that a good hazzan like Danto creates a palpable focus, a presence, a joyous, numinous, holy quality in the house of prayer. Not every congregation can be fortunate enough to have such a performer. Many synagogues still do have professional cantors who lead the services. However, many congregations these days send up basically untrained volunteers to lead the public prayers. Whatever the style, at every service in an actual brick-and-mortar synagogue, Jewish prayer is an orchestrated performance, led by a leader and joined by a congregation. The synagogue members attending the service act at times as a performing chorus and at other times as a listening audience. Now, for your information, I’m postulating in this book that we speak mostly about prayer in a synagogue. To be precise though, Judaism does not require that you attend a community synagogue to engage in sanctioned, legitimate, effective prayer. You can pray alone, at home, or anywhere clean and proper. When a solitary Jew recites the synagogue prayers in private, it still can be a complex and moving performance. But by him or herself, the individual at prayer must play all the parts that I will identify here, serving as the leader, the chorus and the audience. And so, without further adieu, please allow me to more formally introduce to you my first archetype, the performer. This persona is in parts an artist, a poet and a musician. Performers play several roles in the synagogue. These, enumerated below, are the major troupe members, the group of actors, the cast that you will find in the synagogue, and a capsule introduction to each of their roles. o explain what goes on in the synagogue, some people are satisfied to say that the four basic kinds of prayers are Wow! Oops! Gimme! and Thanks!, as described in a popular article, “The Right Way to Pray?” by Zev Chafetz in The New York Times Magazine (Sept. 16, 2009). I don’t find that interpretive approach very helpful, I guess, because I’m not a kid in religious school. Not that it is wrong. There are prayers that fall into those four broad categories. But it’s not enough to stop there and think we have decoded the liturgy in any substantial way. I say “thanks” to theories like those that Gellman provides, “wow” they really make me stop and think, but “oops” I need you to “gimme” more. What goes on in the synagogue is way more interesting and way more complex. How can I get this point across? Let me try this comparison. The sport of golf is reducible to these four actions: driving off the tee, long-iron shots from the fairway, the short game around the green, and putting. But that analysis, though correct, tells you next to nothing about how to play the game or even how to watch the sport. Or consider this comparison. I used to say about opera that I observed the difference between Italian, German and French operas: that the Italian ones are about love, war and love; the German are about war, love and war; and the French are about love, love and love. Now that attempt at cleverness even may be true to some small degree. But, other than suggesting a funny typology, it tells us not much of substance about how to perform or how to appreciate the drama and emotion of any specific opera. nother thing I do not dwell on in this book is to tell you about the origins of the prayers. Why? First off, it’s difficult or impossible to tell when most prayers started and who started them. A real crucial characteristic of any prayer is to make it appear to you to be a timeless tradition, with no beginnings. And, anyhow, even if I tell you of some important cultural practice’s origins—for instance, that baseball was invented by Abner Doubleday in Cooperstown, New York in 1839—how does that help you understand the game? And, as you may know, that simple, recent fact about the origin of the game of baseball is highly disputed. The Doubleday-origin story is thought by many to be part of the sport’s mythology. Jeff Idelson of the Baseball Hall of Fame in Cooperstown, New York has said about the sport’s origin, “Baseball wasn't really born anywhere.” He means to say that the game evolved over a long time, that baseball has no single, discoverable point of origin. And so, returning to our main subject, it’s legitimate to ask: How can I speak with any certainty about the origins of Jewish prayers, events shrouded in much greater mystery than baseball and that occurred up to 2000 or more years ago? We know only that the practices of the synagogue evolved over a long period of time and that they were influenced by many competing forces of history, society and culture. But, just as baseball historians continue to repeat the mythological origin account of the sport, I report the origin narratives of the various prayers in brief at the proper times later in the book. Don’t get all excited though. Here is a sample of what we have to offer. Rabbi Jeremiah (fourth century) says (Yerushalmi Berakhot 4d) in reference to the origin of the Amidah prayer that “One-hundred-twenty elders, including about eighty prophets, instituted these prayers.” These one-hundred- twenty elders are taken to be the men of an obscure group called the Great Assembly. Another source (Talmud Bavli Megillah 17b) has a parallel of Rabbi Jeremiah's teaching about the origin of the liturgy: “Rabbi Yohanan said that, according to some, a baraita taught that one-hundred-twenty elders, including some prophets, instituted the Shemoneh Esreh (i.e., the Amidah, the Eighteen Blessings).” Another rabbinic text links the beginnings of the Amidah to a later authority, Simeon Hapaqoli, who formulated the blessings under the supervision of Gamaliel, the patriarch at Yavneh in Israel in the second century. These traditional origin accounts do not tell a vivid or dramatic story. Overall, there is not much origin-folklore for the classical Jewish prayers. Baseball fares a little better in that department. Art is in the eye of the beholder. Pages from old books are placed in glasses, and voila they become art. Holiness is also in the eye of the beholder. Old printed books contain words from ancient rabbis, and voila they become sacred. 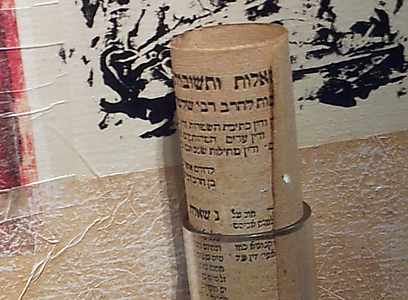 Ynet reports that in Tel Aviv there has been a, "Gallery threatened over Talmud artwork." They explain that the, "Rabbinate vows to stop exhibition of works created by French artist, using pages of ancient rabbinic writings. Display 'desecrates Holy Scriptures,' says Chief Rabbi Metzger"
And so we have a Talmudic dispute about Talmud art. Yes, according to the artist, Talmud art is Kosher. But no, according to the rabbis, Talmud art is not kosher. It is a desecration. The photo of the art shows a page from a book of medieval responsa, legal decisions from the rabbis of the middle ages. Sure, it's always dignified to treat books with religious themes (or for that matter any themes) with proper respect. However, the books in question are not "Holy Scriptures." Looking at some of the words in the text in the photo, these appear to be discussions about writing contracts. Nothing holy about that. Art that intends to desecrate is usually quite up front about it. We recall one exhibit in New York City of Chris Ofili's "Holy Virgin Mary" in 1999, at the Brooklyn Museum of Art, "that featured sexually explicit cutouts covered with elephant dung." Other art that could be criticized or censured by religious authorities because it intends to desecrate include, "Piss Christ" by Andres Serrano and Renée Cox's "Yo Mama's Last Supper," all as described with images of the art on a "controversial works of art" web page. This Talmud art in question does not rise to the level of desecration or sacrilege and does not seem to us to be in bad taste. Hence we deem it kosher. Further we deem the rabbinic objections to the works to be quite out of place and without merit, Hence those rabbinic objections are themselves a desecration. A prayer book containing prayers for the various days of the year. To be sure, this essay is the sage rabbi’s lyrical introduction to the prayer services of the Jews. It is a flowery prologue, meant to be consumed by the faithful. I don’t want to parse its every expressive phrase, can one ever disagree with poetry? I must say though that I don’t think the Siddur is a magnificent symphony festooned with harmonies. I’m certain the rabbi is on the right track, but he stops off at the wrong metaphor. The Siddur is neither a “symphony” nor a “harmony”; as I see it, the Siddur’s prayer service zigs when it should zag. It starts and stops and restarts. It changes the topic of conversation and presentation abruptly and frequently. It meanders and wanders across expanses of time and space. It contradicts and repeats in patterns that seem to have no peers. ven with my varied background, like most Orthodox Jews I spent a whole lot of time in synagogues when I was growing up. As a son of a rabbi, I’m sure that I sat for more time in a house of worship than the average Jewish kid. As a child, my mother schlepped me to shul every Shabbos (the Yiddish word for Sabbath), and I sat mostly quietly and listened to the cantors chant the formal services, leading the members in prayer. I followed along as the expert readers chanted from the Torah scroll. I heard as the shammoses (i.e., ritual directors, also called sextons or beadles) recited the Kaddishes, as they led the mourners in their obligatory recitations of a prayer for their deceased loved ones. I was mainly a well-behaved kid who sat attentively through the weekly Sabbath Torah readings and the haftorah, the chantings from the Prophets. I heard the Rosh Hashanah shofar blowings, taking all of this quite seriously, in accord with what I was taught at home and in school. I marched in the Simchat Torah Hakafot, those parades when the adult worshippers joyously carried the scrolls as they marched and danced around the synagogue. We children were allowed to carry and wave paper Israeli, American and holiday Simchat Torah flags that were pasted to thin wooden sticks. As we pranced around the synagogue with our flags, sometimes we fenced with them and looked for trouble. During the summers, we went to our Long Island summer home in Atlantic Beach. The sleepy Jewish community in that village boasted a single centrally located and nicely maintained rectangular brick synagogue. By design, it was kept Orthodox in its ritual and services so that one inclusive house of worship could serve the whole community, from the more liberal Reform and Conservative to its few ardently religious Jews. Men and women sat separately. But, unlike in other Orthodox shuls, there was no physical wall divider between the sexes. Most of the villagers in fact were not Orthodox in their practices. They’d go home after prayers on Saturday morning and head off quite openly to the beach or to golf, tennis, biking on the boardwalk, shopping or other ordinary weekend activities not normally practiced by Orthodox Jews on the Sabbath. During those summers out in Atlantic Beach, we happily attended the weekly Sabbath services at the Jewish Center. Back then, it was a well-to-do community, without too much ostentation. To attract worshippers, the shul offered a Kiddush collation after the Saturday morning services, and I made sure to fill up a wax paper cup with sarsaparilla soda to go along with my little rectangle of sponge cake and my handful of salty, dry, octagonal Manischewitz Tam Tam crackers. I never touched the creamed herring and did not care much for the little gefilte fish balls that they put out on platters to the delight of the hungry congregants after their lengthy prayers. While I sat in these sundry synagogues as a child, yes, I became familiar with the services and fluent in the liturgy. That turned out later to be both an advantage and a disadvantage to my spiritual growth. Indeed, I could participate, perform and lead the synagogue worship in Hebrew. I knew the tunes, the words, and the cadences. But as I grew older and wanted to find more substance, I learned that adult meaning does not flow easily out of what you learn as a child. Later on, it turned out to be quite complex and daunting to open the book of devotion that I knew nearly by heart, that represented what the Jewish tradition calls the “worship of the heart” and try to turn my mind on it, to study it in a mature manner. And I found that it was harder yet for me to extract an adult’s spiritual experience from the services of these synagogues that I had gotten to know when I was a kid. 1. To recite Jewish liturgical prayers. 2. To sway or rock lightly. 1. A building or place of meeting for worship and religious instruction in the Jewish faith. was born Jewish and raised in an Orthodox Jewish family, but not an entirely stereotypical one. My mother grew up as an American-born Reform Jew in Washington Heights in Upper Manhattan. She went to New York City public schools and then got her BA and MA degrees at Hunter College. My father was reared in an American-Orthodox family. Both of his parents were born in the U.S. He too went to New York City public schools, then to a yeshiva for high school and to Yeshiva University for his college degree, for his rabbinic ordination and for his PhD. At some point, my young professional mother enrolled in a Hebrew class that my young rabbi dad was teaching. Romance followed. After they married, my mom became Orthodox in her faith and practice. In her role as a dutiful rabbi’s wife, she obtained the venerable honorary title of rebbetzin. For an American Jewish family like my dad’s to retain its orthodoxy was not a common story during the decades of the great assimilation prior to WWII. The currents sweeping Jews away from religion were strong during that era. But my mom and dad swam against the currents. I inherited a strong commitment to Judaism from both of my parents. I was born on the Upper West Side of Manhattan, where my father was a dynamic figure on the New York rabbinical scene. He served as a rabbi for two decades, from 1941 to 1961. First, before he married, he played rabbi out in the “minor leagues” in small Jewish communities in Lexington, Kentucky and Omaha, Nebraska. After that, he served in the “big leagues” in pulpits in Orthodox synagogues in New York City. He presided first on New York’s West Side at the West Side Institutional Synagogue (WSIS) as assistant rabbi. It was there in 1947 that he changed his name from Goldstein to Zahavy. He was inspired by the Zionist movement and felt the calling to Hebraize his name, as many other activists and visionaries of that era did. The senior rabbi at the WSIS was the well-known Rabbi Herbert S. Goldstein. When my dad started to serve as a rabbi there, he approached Rabbi Goldstein and told him of his motivations and his idealistic plans to change his name to Zahavy. The senior Rabbi Goldstein endorsed my father’s idealism and then suggested another more mundane motivation for his support of the planned name change. Partly in jest, he explained to the junior rabbi that he had been concerned. If a check had come in to the synagogue made out to Rabbi Goldstein, he had feared that, with two rabbis of the same name, there might be some confusion. Hence, he was happy to hear that my father was going to change his name. After his stint at the WSIS, my rising-star dad moved uptown a few blocks to Congregation Ohev Zedek, where he was appointed associate rabbi. Following that, he moved on to assume the pulpit as senior rabbi at the swanky Upper East Side Congregation Zichron Ephraim (now named the Park East Synagogue). From the age of three, I grew up on the East Side on Sixty-eighth Street and Third Avenue, in New York’s so-called silk stocking congressional district. Not a very spiritual setting. There were few Orthodox children around for me to play with in my neighborhood. Many of Manhattan’s Orthodox families lived down on the Lower East Side or uptown on the West Side. I attended Manhattan Day School, a progressive Zionist oriented elementary yeshiva day school on the west side of the park.